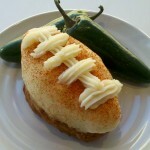 Hopefully you were lucky enough to order the El Loafo Del Fuego meatloaf this past Super Bowl Sunday. Yes, that's mashed potato on top to represent the "frosting." It may sound a little far out, but obviously the people at The Meatloaf Bakery must be doing something right. Instead of opening one more cupcake store. I checked out their site and they do a good job of keeping up their blog, Facebook and Twitter presence to keep their community of meat lovers loyal. And really, where better to launch a unique concept with meat than a meat-loving town like Chicago? It may not be for everybody, but then, I don’t know too many great brands that appeal to everybody anyway. Taking a cue from this example, how are you seizing on an existing trend within your industry yet making it your own in terms of product/service development? Besides tuning into the show, check out The Meatloaf Bakery at 2464 N. Clark and visit the site here. ← I liked the Groupon ads. There. I said it.